Any completed form can be dropped at, or mailed to, our office at 19210 Huebner Road, Suite 100, San Antonio, TX 78258 (we also have a 24-hour drop box accessible to the right of our building entrance.) It may also be emailed to mlorente@mgmtco.com, or faxed to 210-490-1391. Please do not include the completed form with your assessment payment as payments are mailed directly to our bank lockbox, and not the Management Company office. 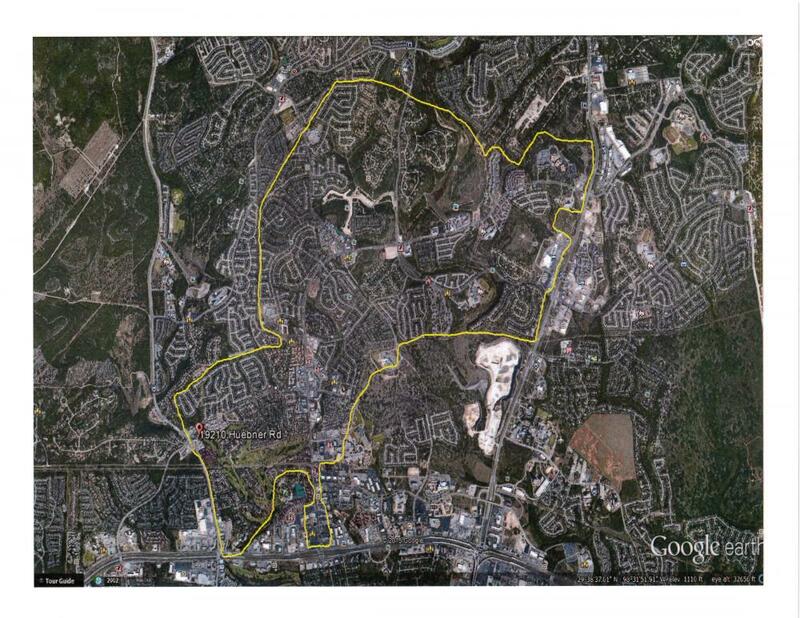 Below is an aerial map with Stone Oak POA boundaries in yellow. Stone Oak is comprised of land that was once several ranches and is the product of the vision of a handful of developers. This small group, led by Dan Parnam, saw in the eighties the potential for a planned community. They took a risk, and developed a community of multiple land uses, utilizing the electric tower easements to develop a golf course. This was a creative but not original idea.....to use a golf course and country club to attract builders for subdivisions around/adjacent to the golf course. They designed the community with multiple land uses to allow for community development ultimately to service the onsite bedroom community. The first master plan of Stone Oak was filed in Bexar County in 1985, and the story began then. The first subdivisions were a handful designed with frontage around the golf course, which are now subdivisions of Sonterra: The Gardens, The Greensview, The Midlands, The Fairways and The Woods. The roads were laid out, utility lines installed, trunk lines for electrical service ......all the mechanics of building began. Then there was a pause caused by the Savings and Loan Crisis. Stone Oak was not immune, nor was its developers, and much of the land went into receivership of the RTC, the Resolution Trust Corporation of the US Government. So development pretty much stopped from 1989-1992, then slowly started again. During this time there was a change in the composition of the developers of Stone Oak. A new investment group took over. Some of the investors were from out of state. Richland Properties was the big player that bought the property out of RTC. They sold lots of property/lots including selling property to the First City group out of which a gentleman named Rick Sheldon, had an interest. Mr. Sheldon bought out the First City group from Waco and stepped into the position of developer. Mr. Sheldon continued the vision of Dan Parnam's group. He had the good fortune to find and hire Buz Buckley who became the Project Manager of Stone Oak until 2008. Development continued under the guidance of this group that always worked to maintain the integrity of the community and enforcement of the master plan. Many thought of Buz as the unofficial "Mayor of Stone Oak". On Jan. 23, 2008, SOPOA was turned over to the citizens and the first Board of Directors was appointed by the developer, whose vehicle was referred to in the documents as the Project Planning Committee( PPC). Buz Buckley served as Chairman the first year but at the end of 2008, Mr. Buckly retired. Stone Oak POA as well as Sonterra POA had been managed for years by Hill Country Mgmt. Services, owned and controlled by Rick Sheldon. At the end of 2008 HCMS dissolved, with Stone Oak and Sonterra agreeing to self-manage together, since they had both been managed by HCMS, beginning 1/1/2009. New office space was found in the same building and a move into the new office space occurred 9/09. Stone Oak and Sonterra share the same office space on Huebner Road but in January of 2013 they dissolved their partnership and now operate as two totally separate entities. The Mission of the Management Company of Stone Oak is to provide services necessary to enforce the second restated master plan, which is charged with the maintenance and betterment of the community as a whole. 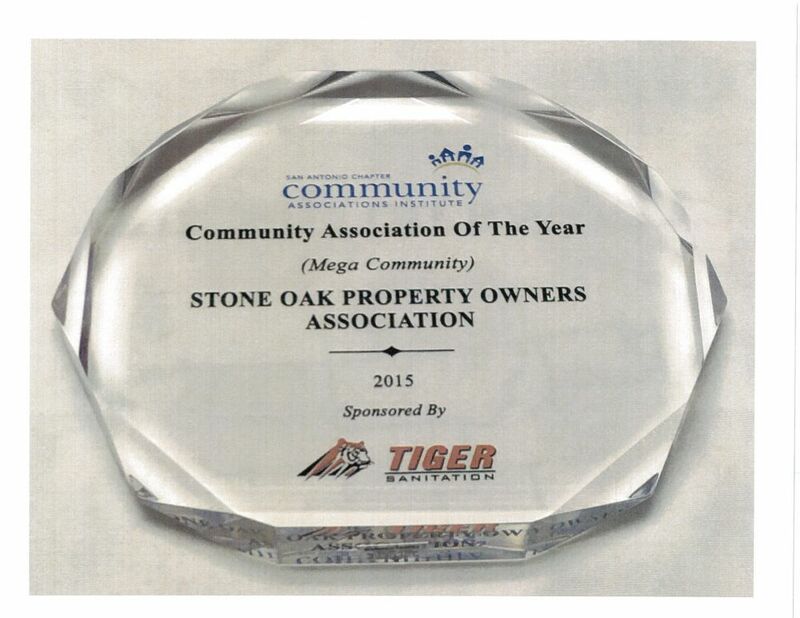 On Saturday, February 6th, at the San Antonio Community Associations Institute Gala, the Stone Oak Property Owners Association won Mega Community of the Year for 2015! Recognition was based on the coordination and planning of water conservation efforts, as well as landscape redesign, while still maintaining the aesthetics of the community, thus setting an example for all property owners. It also included recognition of the POA community outreach projects that assist in conservation and education, such as the Donation & Dumping Events, Shredding Events, Rain Barrel Workshops, and Arbor Day Events. and many volunteers, especially our Board of Directors. Thank you to all who work hard to make our community a great place to live!